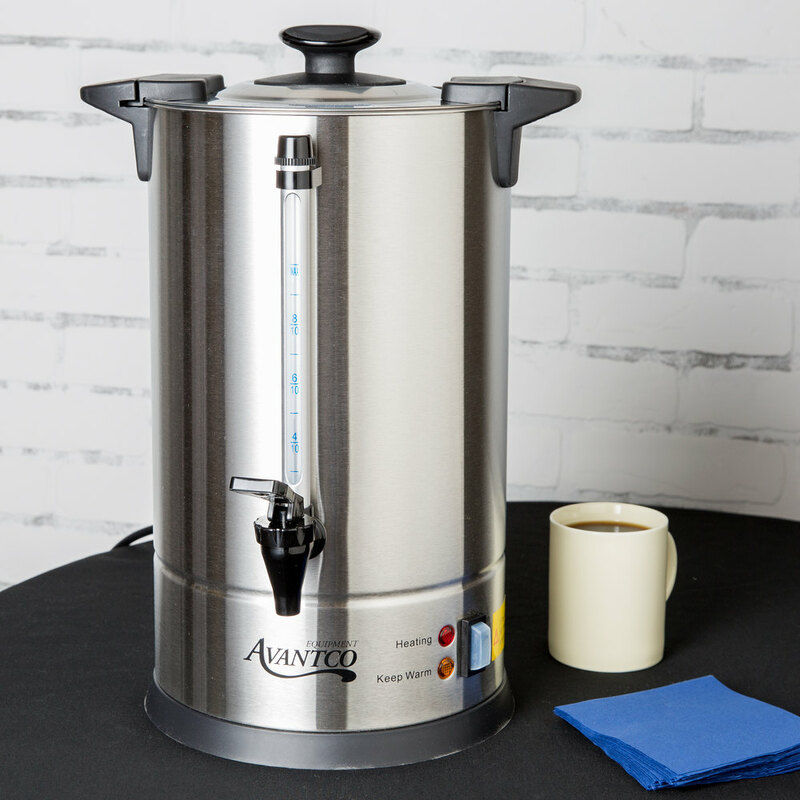 Brew delicious, flavorful coffee day after day with the Avantco CU55ETL 55 cup coffee machine urn is perfect for caterers, schools, churches, offices, and more! This durable coffee machine urn is easy to use, with a heating light to show when it's in brewing mode and a warming light to show that it is in warming/holding mode, which keeps coffee hot and fresh for hours. And because the handles are made of plastic, they'll stay cool even when the urn is hot. A maximum fill line inside helps prevent overfilling, and a convenient sight line shows how much coffee is left. 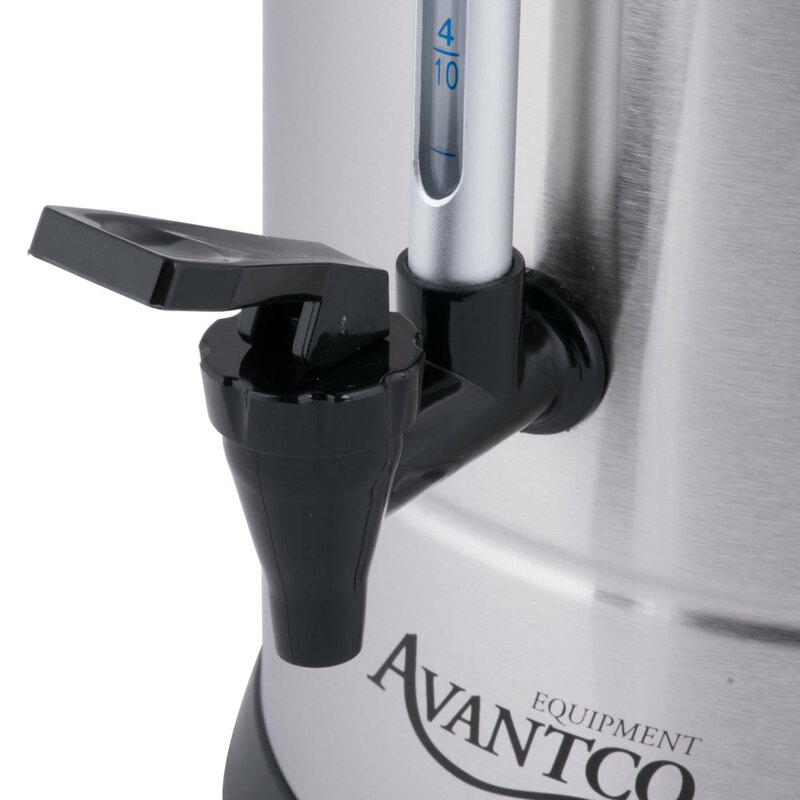 The Avantco CU55ETL coffee machine urn is made of sturdy double wall stainless steel with a locking lid feature for safety and an auto-shutoff switch to prevent overheating. Brews approximately 1 cup per minute. I really like this coffee urn. I use it primarily for hot water, but it works great for coffee as well. Easy to set up, and easy to clean. We just purchased this to replace our previous one. I love the new upgrade. the filter basket is much nicer and it pours out much faster. More efficiency. I will buy more. 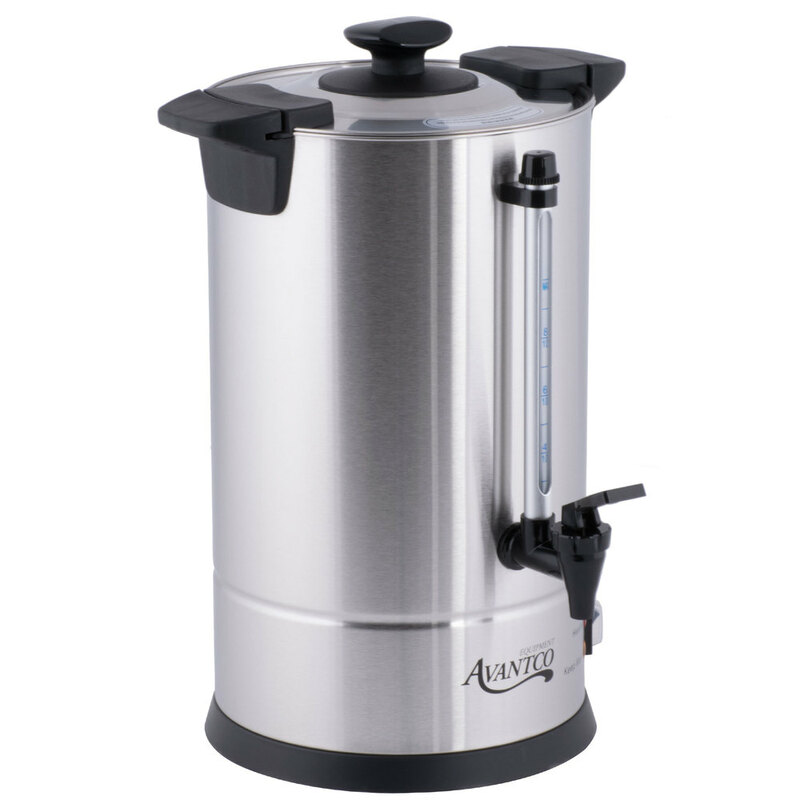 The Avantco 55 cup coffee urn is great for smaller gatherings and works great. The urn is easy to clean and the stainless build helps it last for multiple years. The urn does a great job keeping the contents hot and the dispenser works great. This coffee urn has a great look for any office. It's 55 cup capacity is just perfect for us. Easy to clean inside and out. Working great so far. I bought this to donate to my mosque for hot tea or coffee before the meetings. Good quality and good price. Awesome! and a great price too. Shipping was fast and free we will be ordering more for the schools and for the teachers lounges. We appreciate the fast shipping. We purchased this for brunch as we needed a cost effective way to do a reasonable amount of volume. Maybe not as good as high end brew systems but coffee comes out rich, stays hot and isn't burned. We have had issue with beans being ground wrong and coffee comes out like water but that's not the fault of the percolator. Just be aware that it's not super forgiving in that way. Very nice stainless steel urn, brews quickly and makes hot, clean tasting coffee. Easy to wash and to set up. Looks nice when used as a self-service device. 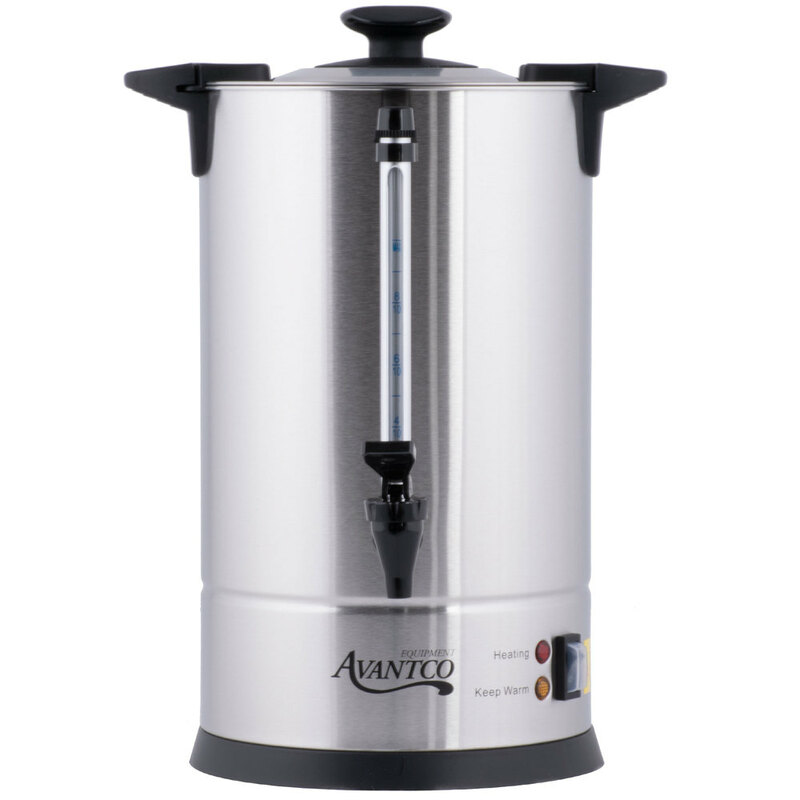 Wonder Avantco 55 cup stainless steel coffee urn. Well made and will last us a long time. Perfect for large gatherings and events. Awesome price. We were in the market for a new coffee maker. I did a lot of shopping around, and this was the best buy and the best product available. This stainless steel urn makes delicious coffee, shows how many cups are available, and is easy to dispense. I recommend this to anyone.